With the mission to deliver high-quality, low-cost care to our most vulnerable, underserved populations, Community Health Centers (CHCs) are leading the transformation to value-based care. 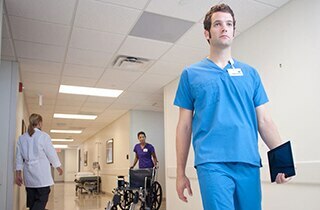 CHCs are experiencing rapid growth in patient population but are severely constrained by IT systems that weren't designed to meet the demands of complex clinical decision making, ever-growing documentation requirements, emerging medical trends, and evolving care delivery and payment models. GE Healthcare is increasing its focus on this very important issue. Collaborating with best practice CHCs, GE Healthcare is designing a flexible new solution specifically for CHCs. Our innovation is combining tools for comprehensive care delivery, financial management, population health, patient engagement, analytics, and connectivity into a single solution. Integrated care delivery tools and clinical decision support help your teams deliver more informed care, coordinate it across care settings, and continuously improve. Document thoroughly at remarkable speed with CHC-specific content, simplified data entry, seamless integration of external data and optimized workflows. Effectively fund your mission by optimizing payments from multiple revenue streams, reducing cycle time and simplifying reporting with easy aggregate data capture. Streamline existing processes and leverage cutting-edge tools to manage population health, increase patient access, coordinate and integrate care across settings, reduce cost, and improve quality of care and financial performance. We are building on the strengths of Centricity™ Practice Solution and will continue the evolution to a fully integrated, interoperable and intelligent cloud-based software solution. A single, comprehensive solution available only from GE that puts patients back where they belong - at the center of care. GE Healthcare knows that providing high-quality, patient-centered care at a low cost to the most vulnerable and underserved patients in our communities is important to your CHC. Our new Community Health Solution and its population health capabilities support your mission by helping you prioritize patients, coordinate care, and more efficiently deliver care that closes gaps and follows “best practices” for specific conditions. The flexible population health solution enables providers to deliver informed care more efficiently than when using an EMR alone. It also helps CHCs increase participation in health initiatives by facilitating quality metric reports to third parties for grant funding and contracts. Prioritize patients for intervention - Easily visualize patients with gaps in care and group them with others who share similar health issues and prioritize groups for intervention. Efficiently manage populations - Develop condition-specific care plans, apply them to the appropriate population, and efficiently manage activities for the entire group. Coordinate across the care team - Role-based workflows enable more efficient execution of patient specific care plans and easy collaboration with other members of the care team. Deliver thorough, consistent care - Point-of-care decision support, incorporating data and evidence-based guidelines, helps you consistently close gaps in care during the visit. How can Value-Based Care Analytics help you enhance care quality, reduce total medical expense, and fund your mission? As a community health center, you are focused on delivering the highest quality care at the lowest cost to the underserved people of your community. But without sophisticated tools to track your performance, it’s difficult to validate how well you’re closing care gaps, if your staff is excelling, and if you’re getting paid appropriately. The comprehensive and sophisticated Value-Based Care Analytics component within our CHC solution transforms EMR data and claims-based data into insights you can use to make sure you’re achieving your goals. With areas specific to performance, utilization, patients, risk, and operations, you can easily identify patients who need care, providers who may need help, and business areas in need of intervention. Drive staff performance – Provider performance area provides insight on HEDIS, PCMH, and UDS so you can identify and coach those who need help earning incentives. Reduce total medical expense – Areas to visualize variability in cost and utilization help you avoid unnecessary medical expenses. Prioritize care – Unified patient registry lets you ensure patients who need the most, get the most. Facilitate patient visits – Pre-visit planner helps the care team see care gaps before the patient appointment so you can optimize the visit. Accurately convey patient risk – Open risk indicator visualizes suspected documentation gaps, helping practices ensure claims convey patient risk to payers so you can more effectively fund your mission. Minimize workflow inefficiency – Optional optimization services leveraging day in the life views of provider and staff activities track EMR usage and signal where workflow adjustments are needed. Average results for sample of 144 practices, with initiative periods ranging from 3-18 months based on project complexity.